Planar Drivers: Not your typical in ear driver! A planar magnetic driver is a flat membrane that is surrounded by magnets. When current is delivered, the membrane produces sound that has lower distortion, better bass, and pinpoint imaging that is usually not found in your typical headphone driver. 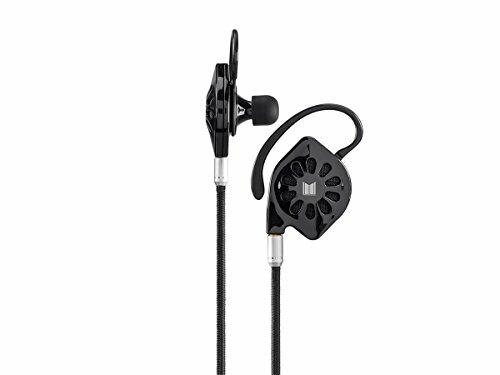 The size of the driver in the Monolith M300 is 28mm, with bass that extends down below 20Hz. Open Back Design: A rarity in an IEM, the Monolith M300 features an open back design. Instead of an "inside your head" isolated experience that traditional earbuds provide, the M300 provides a holographic listening experience. It's as if you're in the middle of a live performance, instead of being closed off from the world. Comfortability: The Monolith M300 has been engineered to be comfortable for extended listening sessions. Incredibly lightweight, the M300 comes with multiple sized ear tips, ear hooks and earlocks for long listening comfortability.